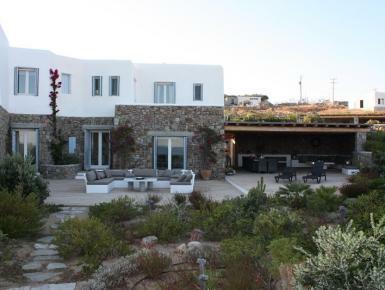 This luxurious villa is situated in the southwestern part of Mykonos across the island of Dilos in an area called Ornos only seven minutes away from the town (Chora). A few minutes away from the villa you can find a supermarket, a pharmacy and a 24 hour bakery shop. Ornos Beach is located on the southwest corner of Mykonos island and only tree kilometers from Mykonos town , this area has recently developed into a self-contained village. Together with places to eat and drink there are also supermarkets, butcher, pharmacy, and bakery. Due, for the most part to the sea’s sandy bottom which drops off very gently from the shore, Ornos beach provides the perfect family beach.